When I was 13 or so, I asked for a keyboard for Christmas. I invested my allowance in a number of books for my keyboard, and spent hours in my room learning the notes. I placed cheat stickers on the keys of my Yamaha, so that if I got lost I could look down and find my place. Oh how I wanted my hands to speed over the keys. Over and over I practiced the songs and tried to improve. My Mom recently brought the keyboard to the house for the boys. It's the exact model that I had - she said she found it in my grandmother's basement. I don't think it is my old one (after all, there is no residual sticker residue on the keys) but it is the same. The Yamaha can play one song on its own. Billy Joel's Just the Way You Are. It plays it with different instruments, demonstrating all the wonders the keyboard can do. The refrain is familiar in my mind - musical paths untraveled for many years, but still worn to a groove in my mind. Yes, readers, this keyboard has been quite the hit with the boys. It's seen a few fights in the past week. And some happy banging and singing too. I confess that I don't mind the memories. man, your boys are so darn cute, lisa! Carrie used to play on her mother's big keyboard when that age. One day she accidentally turned on the demo while I was doing a video and it looked like she suddenly started to play a song, so funny. It is good to let them play with instruments early, they are more likely to get into music later as it was fun when they were little. Happy Thanksgiving to you and your family... do you run more on these festive times? What an awesome gift to all of you! Hope you have a wonderful Thanksgiving! So cute! I love to hear children singing with abandon. I have a keyboard now, and it's fun to try out the different instruments. Now I'll be singing "Just the way you are" all day. :-) I don't think it's cheesy. really cute. i had an old keyboard for a while, too. Kids just love to make music! Hope you have a great Thanksgiving. Hope nothing-I KNOW you will. Happy Thanksgiving to you all too, Lisa! What fun for your boys! I always wanted to be musical.. alas.. lol. I was given a Yamaha keyboard piano and I really enjoy playing some old hymns that have stuck in my mind. I don 't need music the notes just come. Glad your boys like your piano. Maybe in the near future you can hear something lovely.ta ta for now from Iowa. Bet they have a blast making their own music! I wish I'd remember how to play, so my keyboard doesn't just sit there for decoration. Awww, Lisa, this is wonderful! I am hearing Billy in my head now! What will you be doing tomorrow, staying home? I wish you the best ever Thanksgiving! And how wonderful about the keyboard!!! Perhaps someone did manage to clean that sticker glue off, wouldn't that be fabulous? 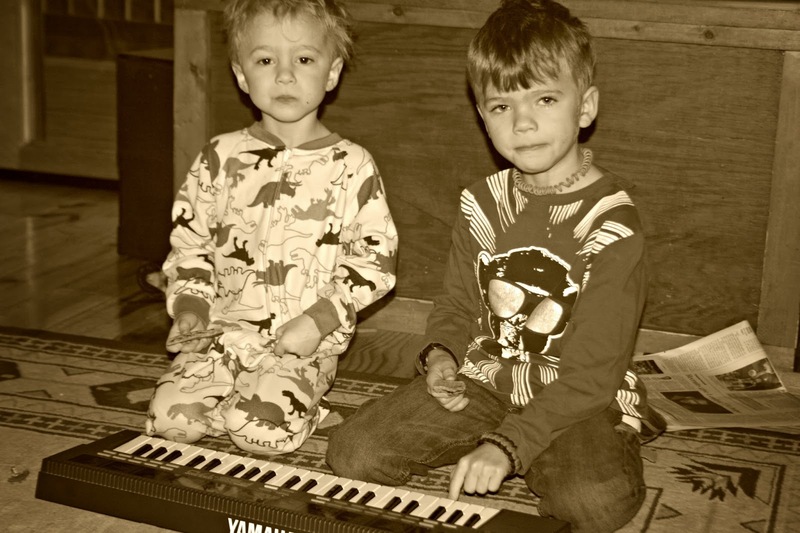 I'm sure the boys will have many hours of singing and fun on the keyboard. Who knows, maybe one of them will decide to get as serious about playing as you were! I thought those were very kind sentiments. what cute boys! wishing you and yours a Happy Thanksgiving, full of good memories, great food and family. Happy Thanksgiving to you. Such fun memories! Enjoy your family! I really love this song. I still enjoy the 80's songs. Easy listening. An evergreen song. Your not being cheesy- your saying what you feel! And we feel it too. That is the coolest gift! And we know its going to be so loved. Memory lane has some places to stop and sit, and reflect. Thank you for taking us there. It looks like you will have music along with a feast! Happy Thanksgiving! I like Billy Joel. :) That is fun that your boys are playing on the same kind of keyboard you had too. Happy Thanksgiving to you! I hope this Thanksgiving Day is wonderful for you and the family. My kids and grands loved those keyboards also..
We are in FL with George's son and family enjoying Thanksgiving. They are cooking a FEAST for us… YUM. Just The Way You Are . . .
(i wonder how many times i played & sang that song all over the nation? Billy Joel is good, any time of the year. Happy Thanksgiving. Blessings and Bear hugs! 80s music is the best! Love some Billy Joel!The boys had a great time with the remote control helicopters - all the boys 27 to 13. I think there could be a couple of fights over them over the next few weeks! LOL Happy Thanksgiving - and wishing you a joyful Christmas season! Oh my goodness my sister had the exact same keyboard.